Either bring your medical card to reception or ask for a registration form. Also, please complete our a New Patient Questionnaire. Once you have downloaded the forms, print them out, complete them and bring them to reception. Once you have registered, your records from your previous surgery will be sent for, but it can take several months to get these. Therefore, it is best to register as soon as you can. When you attend here for the first time, it is helpful to bring your repeat prescription slip with you if you are on regular medication. You can see whichever doctor you want, but we encourage you to see the same doctor whenever possible, as you will get better continuity of care. When your doctor is on holiday, you can see another one if your problem really cannot wait. As a new patient you can request an appointment for a new patient check if you feel it would be appropriate. Over the years this practice has gradually grown in numbers of patients. At the same time, the workload has increased, as it has in all practices across the country, with patients now attending on average six times a year as opposed to three times annually twenty years ago. The result of this expansion is that it is becoming more and more difficult to meet the need for consultations, which has resulted in patients having to wait longer than ever for routine appointments. There is no possibility of increasing the number of doctors, nurses or other staff due to the constraints of the premises. The only way we can address this problem is to put a cap on the number of patients we can have on our list. For this reason we have changed the area within which we accept patients for registration. Any existing Barn Close Surgery Patients moving outside of our practice area will need to register with another practice. 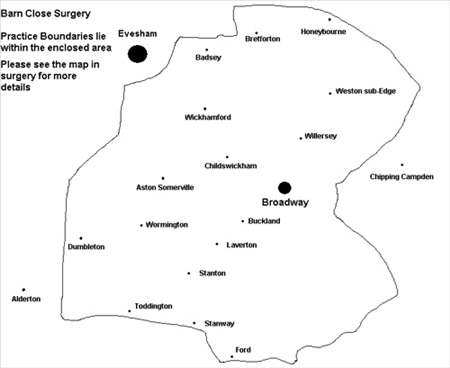 For some time now we have not accepted new patients within Evesham, as there are four practices serving that area. For the foreseeable future we will continue to look after patients currently registered with us at an Evesham address. We are no longer registering any new addresses in Evesham, so if you live there and move to a different address within Evesham you will need to register with one of the Evesham practices. This is our position at the present time. It is possible that work pressures may require us to consider removing patients resident in Evesham from our list altogether, but we will avoid doing so for as long as we can.